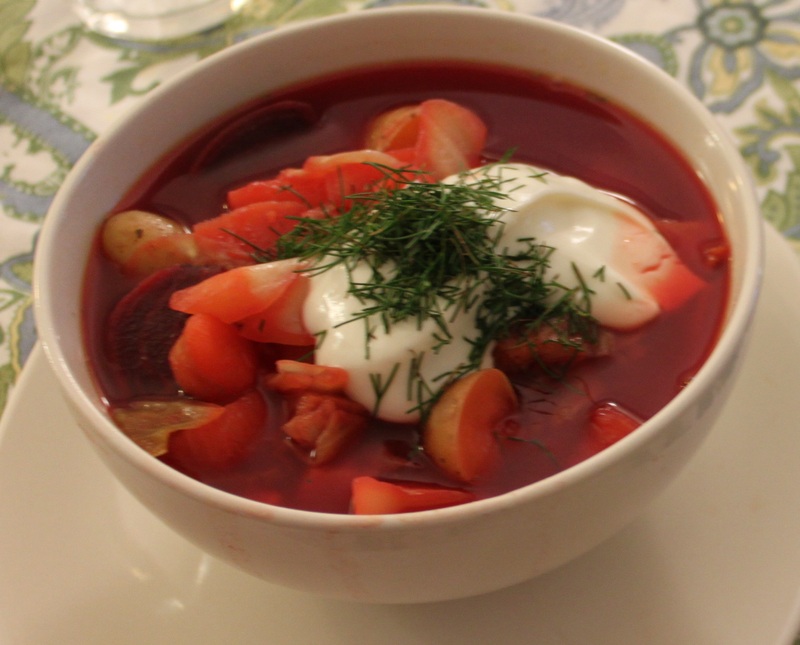 Eating borscht brings me back to Dubna, Russia 20 years ago (Yikes!). I lived there for a summer and then was studying in Moscow for the fall semester. I came back to Dubna to visit my host family in late September. It was the first snow with all the magic that first day of snow brings. 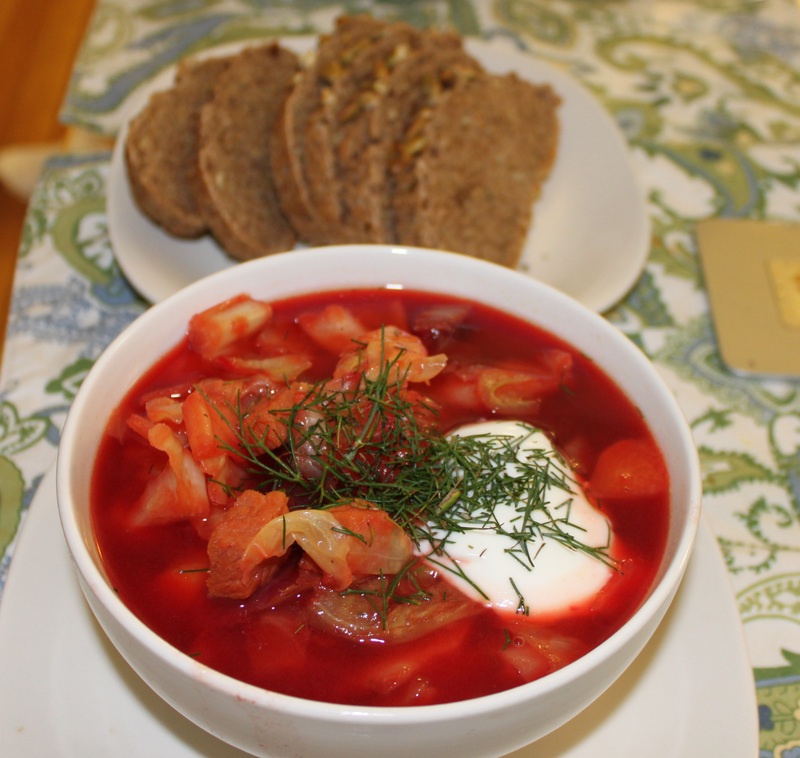 My host brother met me at the train station in the largest ushanka (furry hat with flaps) I had ever seen and brought me home to where Mama had made borscht. It was the perfect dish to go with the big, fluffy, Russian snowflakes. If you can pull off some hearty bread with it, you’ll be eating this in total style. To be honest, I don’t really use a recipe when I make this. I more pick up the ingredients at the grocery store and then start chopping. As my pot gets fuller, I stop chopping. You can make this vegetarian by leaving out the ham. Feel free to make changes to the veggies to suit your tastes or what is available. The beets and cabbage are the most critical parts for the right feel. The pictures show a double recipe. * Tsardust spice is made up of salt, garlic powder, cinnamon, pepper, nutmeg and marjoram. To recreate it, mix together as many of those spices as you have, going heavier on the garlic and cinnamon to get to about 1 tsp. 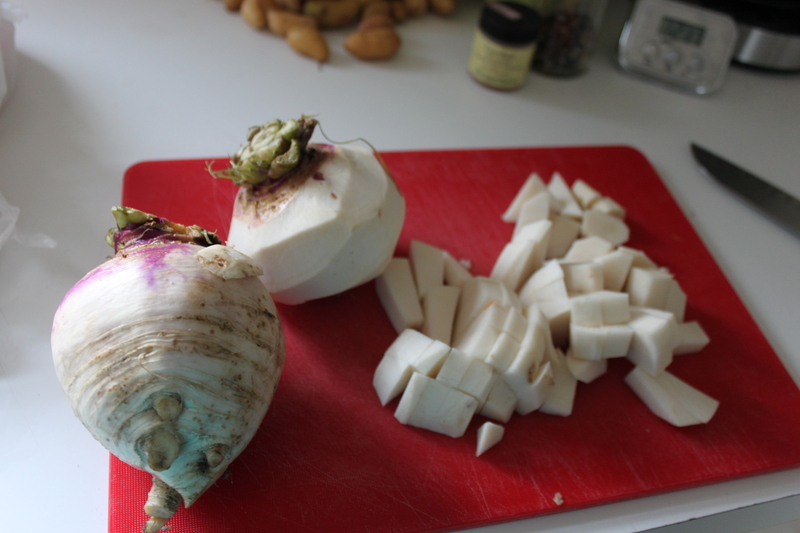 Turnips are easy to work with. Just peel off the waxy skin and chop! Preheat the oven to 400. 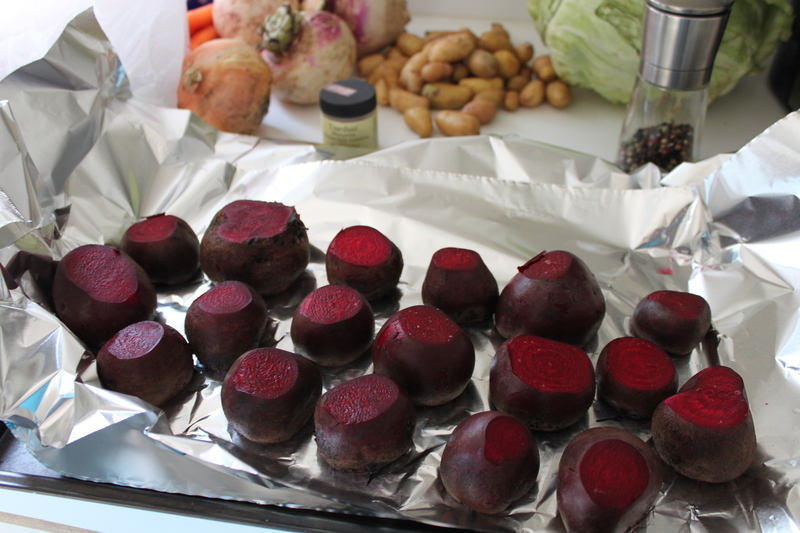 Wash and trim the tops and bottoms off of the beets. Put a layer of aluminum foil on a baking sheet. Put down the beets making sure they are spaced out as much as possible. Cover with more foil and crimp the edges to seal them in. Bake for about 1 hour or until you can push a fork into them easily. Take them out and cool, slip off the peels if you want, but not necessary. While the beets are cooking, chop up the onion into medium dice. Heat the oil in a big stock pot and add the onions. Cut up the carrots (into rounds) and add to the onions. Cook until they are starting to get tender. Add in parsnips/turnips, salt, pepper and Tsardust. Mix them up all up. Add in the broth and bring to a boil, reduce to a nice simmer for about 15 min. While that cooks, chop up the potatoes into small pieces (picture them on a spoon). Add to the pot when the timer goes off. Turn the heat up a little so you keep a good simmer going. Set timer for 15 min. 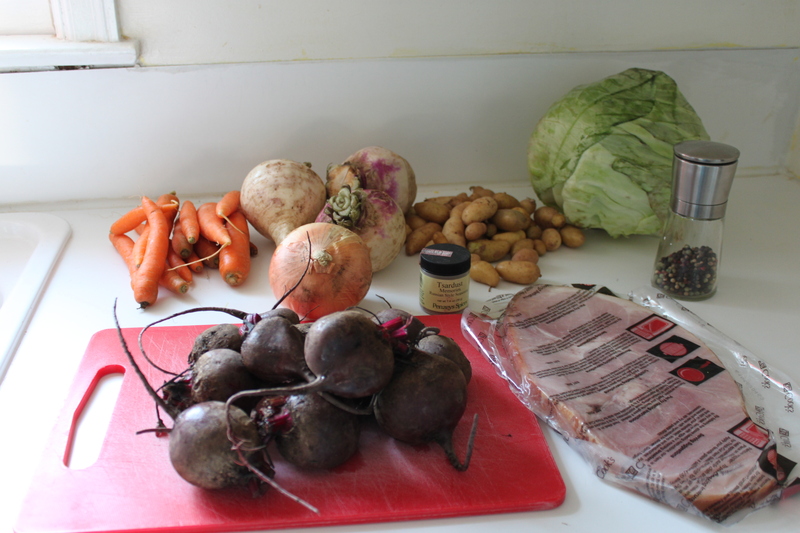 Meanwhile cut up the ham and beets into same size pieces as the potatoes. Add them to the pot when the timer goes off. Cut the cabbage in quarters (starting at the core each time), cut the core out and wash. 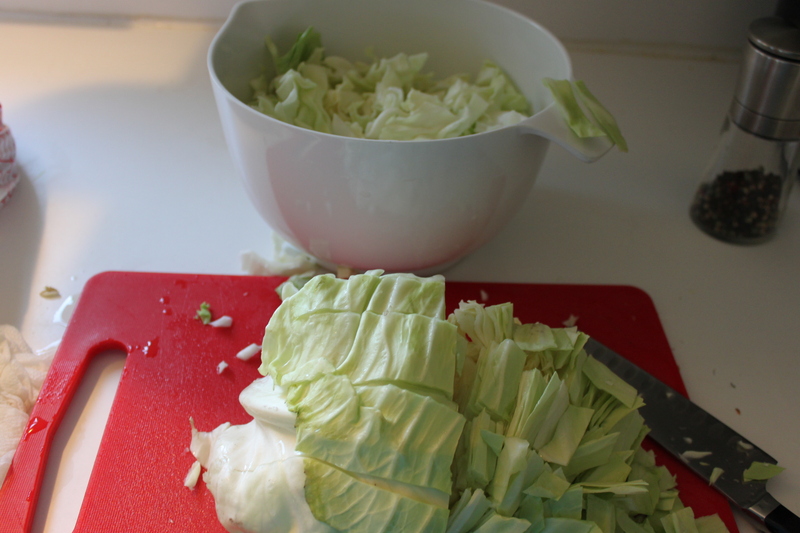 Thinly slice the cabbage and add to the pot as you go. Stop when you feel you have enough cabbage in there (for me about half-3/4 of a medium cabbage in this double recipe). Simmer until the cabbage cooks and it all comes together. Serve with a dollop of sour cream and some dill. Both are totally necessary for the full taste. The sour cream transforms the soup into a creamy one and the dill brings a fresh flavor to the soup that is wonderful.